The Primetech PP-series of disc pulverizers are high speed, precision grinders for the processing of medium hard, impact resistant and brittle materials. Typical applications are the pulverizing of granulates from plastic profiles, tubes, sheets, edge trim materials, film waste and also products from the food, chemical and pharmaceutical industry. 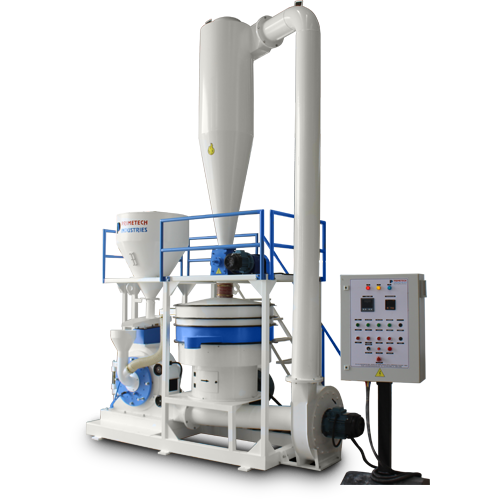 The material to be pulverized is introduced through the center of a vertical fixed grinding disc which is mounted concentrically with an identical high speed rotating disc. 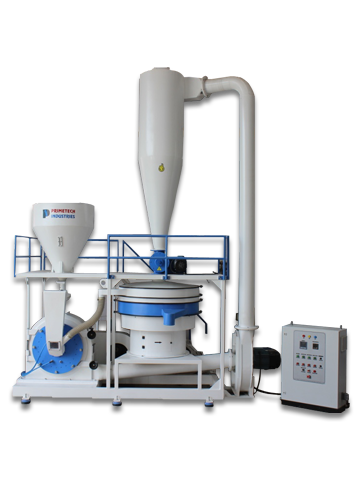 Centrifugal force carries the material through the grinding area and the resultant powder is collected with a blower and cyclone system. The Primetech PP series have several technical advantages which ensure ideal performance and operation. Recycling of RPVC,uP.V.C,cP.V.C, soft PVC, PU & UHMW . Master-Batching application and various thermoplastic material.